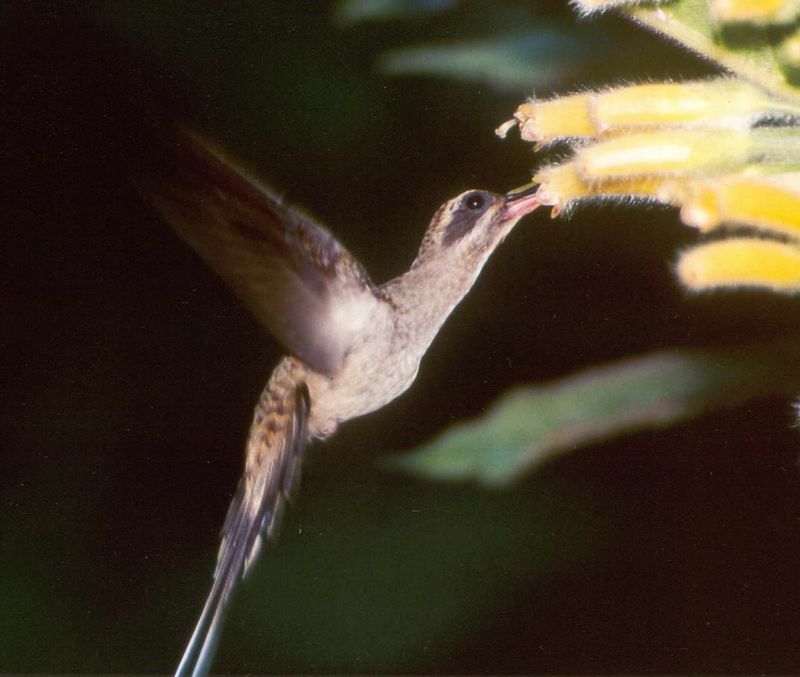 Columneas are pollinated primarily by hummingbirds of several species. Here, Phaetornis superciliosus feeds at flowers of Columnea polyantha. Determining what pollinates a particular plant is actually a daunting task, since to truly be considered a pollinator, observations must be made to show that pollen is actually being moved from one flower to another and that when this animal (vector) is excluded, the plant is unable to produce fruit. Despite that, floral form, color, nectar production, etc. can be characterized to see if they fit into a syndrome. Syndromes are based on multiple studies across wide arrays of plant and pollinator species and are reasonably reliable determinants of classes of pollinators. 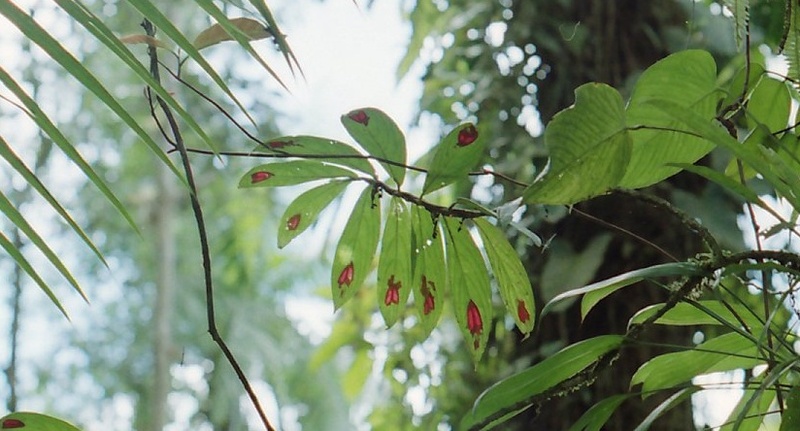 Given this, most species of Columnea can be characterized as having a hummingbird pollination syndrome. The corollas are long and tubular in their shape, thus probably eliminating larger bees from entering but allowing the long bills of hummingbirds to reach the nectar at the base of the corolla. Flowers, including often the calyx as well as the corolla are generally brightly colored: either red, yellow, orange or often a combination of these colors. When flowers are more inconspicuous in their coloration such as being white, pale yellow, or obscured by bracts and leaves, the leaves themselves may function as a signal to hummingbirds that flowers are available. Jones and Rich did a study of this in the Costa Rican rain forest and showed that hummingbirds could be attracted to plants that did not have flowers, but were artificially given red colored spots on the undersides of their leaves. This aid as a signal to pollinators could be the explanation for the brightly colored spots and undersides of leaves and the translucent red “windowpanes” commonly seen in many species of section Collandra. Continuing along the hummingbird syndrome, flowers of Columnea are odorless since most birds lack a well-developed sense of smell. Recent work conducted by Oscar Humberto Marín-Gómez in Colombia and Ben Weinstein in Ecuador has verified that several species of hummingbirds are the primary pollinators of Columnea. The “windowpane” markings on C. florida are visible at considerable distance when back-lit, and undoubtedly serve to attract hummingbirds to the small and dull-colored flowers.